Bile acids have been discovered as regulatory molecules which activate nuclear receptor FXR-mediated signalling pathways involved in the regulation of glucose, lipid and energy metabolism and therefore play a pivotal pathogenetic role. It is has been described just recently that lipid-soluble vitamins like vitamin D affect bile acid and cholesterol/lipid metabolism. Like the bile acid receptor FXR, nuclear receptors for vitamin D (VDR) and A (RXR) induce the expression of fibroblast growth factor (Fgf) 15 (human ortholog FGF19), an intestine-derived hormone that acts on the liver to inhibit Cyp7a1. Protective effects attributable to bile acids and FXR on hepatic insulin signalling are likely due to their activation of Fgf15 expression in the intestine, which in turn stimulates hepatic PI 3-kinase activity through FGFR4. Whereas a variety of data suggest the potentially beneficial role of vitamin D in treatment of NAFLD neither its therapeutic usefulness nor the underlying mechanisms are known today. We therefore aim to clarify the intestinal and hepatic mechanisms underlying the beneficial metabolic effects of vitamin D in detail and to assess its suitability as a therapeutic target for fatty liver disease. 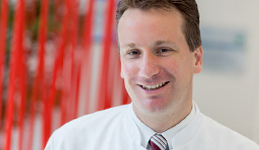 Based on recent findings a clinical multicenter study investigating beneficial effects of vitamin D in the treatment of steatohepatitis (NASH) is currently performed http://clinicaltrials.gov/ct2/show/NCT01571063?term=vitamin+d+steatohepatitis&rank=2. The development of NAFLD in patients is still incompletely understood. Currently, there is no medical state of the art intervention treatment for fatty liver disease with proven long term success. We currently investigate the so far ambiguous role of cytokines in NAFLD and assess the suitability of cytokine intervention as a therapeutic target for fatty liver disease. 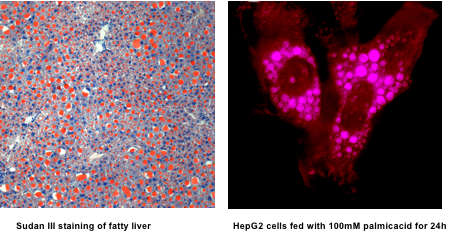 Microscopy of fatty liver tissue (left) and cells treated with fatty acids in culture (right). The metabolic syndrome is defined as the clustering of abdominal obesity, elevated blood pressure, impaired glucose tolerance or overt diabetes mellitus type 2, hypertriglyceridemia, and low high density lipoprotein cholesterol. As multifaceted the symptoms and consequences of the metabolic syndrome as diverse appears the pathogenic origin, although excess and ectopic fat deposition as well as the resulting insulin resistance are considered as pivotal pathomechanisms. Biomarkers are hence urgently needed, which more specifically reflect the pathogenesis of the metabolic syndrome. miRNAs are non-coding ribonucleic acids (RNAs) of 19 to 22 nucleotides that bind to complementary sequences of target mRNAs and silence gene expression through translational repression and/or destabilization of mRNA. It is assumed that at least 60% of human genes are targeted by about 1000 different miRNAs. As the result miRNAs regulate many biological processes including cellular differentiation, proliferation and apoptosis as well as immunity and metabolism. micro RNAs (miRNAs) are potential pathogenic factors and biomarkers of either the metabolic syndrome. In this collaborative project we hence intend to investigate the relevance of circulating miRNAs as both pathogenic factors and biomarkers of MetS and its complications. Ziel dieses Forschungsprojektes ist die Untersuchung der zugrundeliegenden immunologischen Prozesse zwischen Darm und Leber bei Patienten mit nicht-alkoholischer Fettlebererkrankung. Im Rahmen eines innovativen Ansatzes soll hier die Zusammensetzung der Darmbakterien (Mikrobiom aus Stuhlproben) zusammen mit der Immunzell-Aktivierung im Darm und deren Rekrutierung in die Leber als den Ort der Entzündunguntersucht werden.